Pre-heat oven to 191°C / 375°F. Peel and core fruit. Cut each apple slice in half, cut peaches to similar size. Place in baking dish for now. In a large bowl combine: white sugar, flour, and cinnamon. Add fruit to bowl, and toss until thoroughly coated, then transfer back to baking dish. In a medium bowl, combine: oats, flour, dark brown sugar, cinnamon, nutmeg, and cloves. 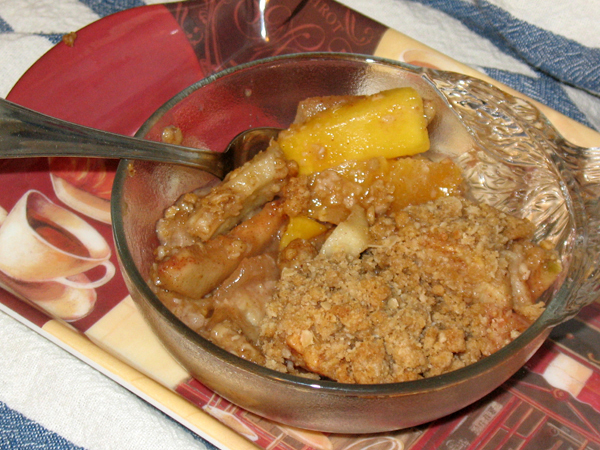 Place baking dish onto cookie tray, and sprinkle crumbly mixture over fruit. Cool 1 hour and serve.